Ash wood, unstained, finished in Danish oil. Includes aluminum monorail with medium duty seat. 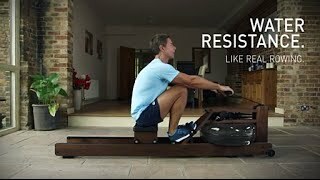 The GX Home rowing machine includes the GX logo burned into the wood of the front left and right of the machine, as well as the patented GX monitor. WaterRower GX models are fitted with the patented quickstart purposely designed for simplicity and ease of use.